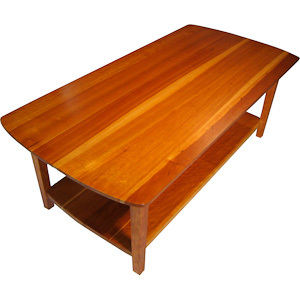 The Boothbay Coffee Table brings the same simple elegance of curved sides and tapered legs as the coffee table. A hand rubbed oil finish with a wax topcoat over Black Cherry wood was used in the design shown. The top, like the coffee table, has curved ends to match the frame and a coved finish detail around the underside of the top revealing a thin delicate edge. The bottom shelf also has curved ends matching the contour of the frame and top. A drawer option is available and each piece is available in three standard sizes. In this example there is a mix of heart and sap wood.